Acanthodactylus longipes. Merzouga. Photo: © Mario Schweiger. Mario Schweiger (2012): Acanthodactylus longipes Boulenger, 1918. In: Martínez, G., León, R., Jiménez-Robles, O., González De la Vega, J. P., Gabari, V., Rebollo, B., Sánchez-Tójar, A., Fernández-Cardenete, J. R., Gállego, J. (Eds.). Moroccoherps. Amphibians and Reptiles of Morocco and Western Sahara. Available from www.moroccoherps.com/en/ficha/Acanthodactylus_longipes/. Version 4/10/2012. Accessed 25 Apr 2019. Español: Lagartija de la arena. English: Long Fringe-fingered Lizard, Long-footed Fringe-toed Lizard. Français: Acanthodactyle à longs pieds. Global range map of Acanthodactylus longipes. Acanthodactylus longipes panousei Bons & Girot 1964 is, following Crochet et al., 2003 not valid. Acanthodactylus longipes belongs to the A. scutellatus group. 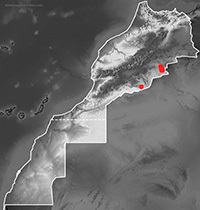 Over a wide range from Morocco in the west to Libya in the east it shares the same distribution and also nearly the same habitat with Acanthodactylus dumerilii. Male. Merzouga. Photo: © Mario Schweiger. It is nearly impossible to assign a specimen to one of these two species in field, because they share most of the diagnostic features. Both species only differ in the number of dorsal scale rows, but these counting are hard to do without a magnifier and on a life specimen. Scalation differences between A. dumerilii and A. longipes after Crochet et al., 2003. For us, the most easy difference in the field was the coloration of both species. While A. dumerilii shows some dark brown to black tiny spots on the flanks, these have been lacking in all A. longipes specimens. Therefore, A. longipes has a much more uniform appearance in coloration. Acanthodactylus longipes is a lizard species of the open, wind blown dunes. We observed them high up in the dunes or in dune valleys, far away from any vegetation. Only a very few specimens have been encountered at the edge of dunes with some more dense vegetation (bushes, halfa grass), where it shares the habitat with A. dumerilii (own observations at Erg Chebbi, SE Morocco). It hides in self burrowed holes, which are digged every day new. Like other desert species, it is active during full sunshine on the hot sand. To avoid burnings, it lifts its body or its feet from the hot sand regulary. Acanthodactylus longipes is distributed throughout the Sahara from the Atlantic coast in the west (Mauritania) the Sinai in the east. To the south it lives up to the Sahel zone. 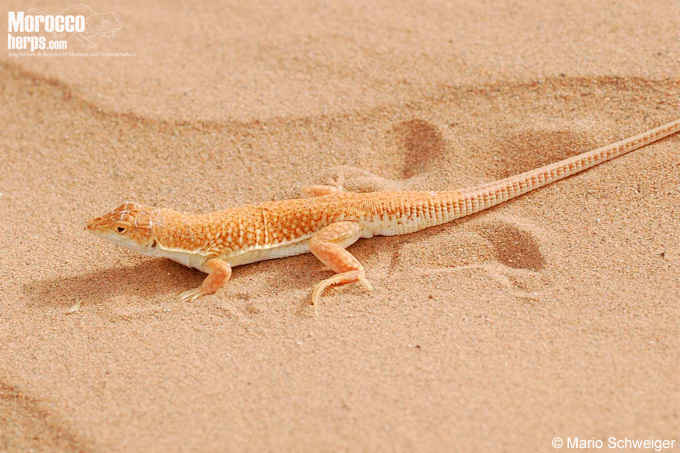 In Morocco Acanthodactylus longipes lives in the dunes of Erg Chebbi and the dunes of Mhamid. There is no official record for the Western Sahara, although it is known from very close regions in Mauritania (dunes of Ouarane) (Geniez et al. 2004). Habitat. Merzouga. Photo: © Mario Schweiger. We could observe them only on large open dunes with no or just very few vegetation. 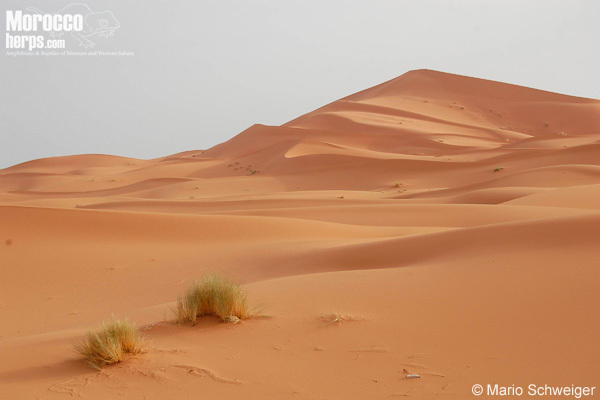 Near the Erg Chebbi, where it is very common, we didn’t find it on smaller dunes, separated by less than 2 kilometers of black Reg desert from the Erg, some kilometres north of Merzouga. Whole range of species: Lower risk-least concern (LR-Lc). Boulenger,G.A. 1918. Sur les lézards du genre Acanthodactylus Wieg. Bull. Soc. zool. France 43: 143-155. Crochet, P.-A., P. Geniez & I. Ineich 2003. A multivariate analysis of the fringe-toed lizards of the Acanthodactylus scutellatus group (Squamata: Lacertidae): systematic and biogeographical implications. Zoological Journal of the Linnean Society, 2003, 137: 117–155. With 21 figures. Geniez, P.; Mateo, J.A. ; Geniez, M. & Petgher, J. 2004. 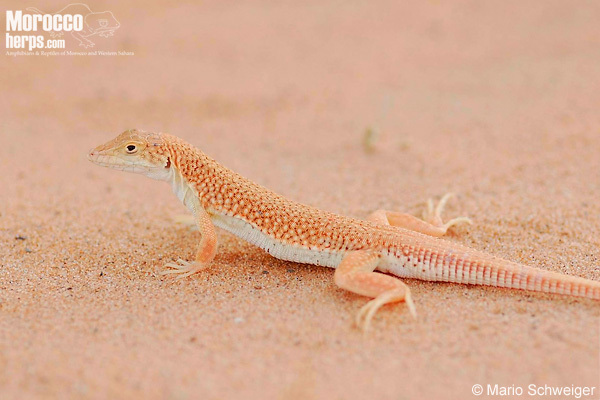 The Amphibians and Reptiles of Western Sahara. An Atlas and Field Guide. Frankfurt Contributions to Natural History, Vol. 19; Ed. Chimaira 230 pp.